Looking for Medicare plans in Texas? Learn who’s eligible. What types of coverage is available. Compare your options. Easily find Medicare supplement plans in Texas. And get Medigap insurance quote comparisons. In 2015, there were 3,633,784 Medicare beneficiaries in Texas. Texas Medicare recipients are ranked 2nd in population in the United States. Seniors should be aware of their options when turning 65 and new to Medicare in Texas. Part A is one of the main parts of Medicare. Part A is your hospital insurance. Part B is the second part of Medicare. Part B is your medical insurance. The 2016 standard premium for Part B in TX is $121.80. Medicare Part B helps cover doctors office visits. Durable medical equipment. Outpatient surgery. Physical Therapy. Preventive services. And more. There’s a $166 annual deductible for Medicare Part B. Then it’s 80/20 coinsurance. Medicare Prescription Drug Plans – In 2014, there were 34 Part D Prescription Drug Plans offered to Texas Medicare beneficiaries. Choose between 17 insurance companies to enroll with. Some companies have multiple drug plans to choose from (that is why there are 34 plans available). Contact Retirement Transitions for Prescription Drug help. Medicare Advantage Plans (MAPD) – In 2014, there were 126 different types of Medicare Advantage Plans available in TX. Availability of Medicare plans in Texas depends on your location. 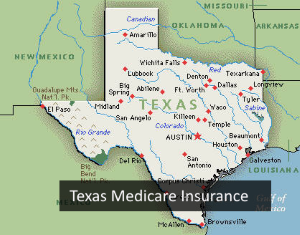 Medicare Supplement (Medigap Insurance) – There are 10 standardized Medicare Supplement plans available in Texas: Plans A, B, C, D, G, F, K, L, M, and N.
The costs of Medicare plans depend on your service location, availability of the plan, and which insurance companies offer that plan in Texas. More information can be attained by calling Medicare. Compare Texas Medicare supplement plans, coverage, and quotes from multiple insurance companies. All you have to do is enter your age, birthday, gender, and tobacco user or not. Comparing rates from Medicare supplement insurance companies can save you a lot of money. This is because the benefits for each specific Medigap plan stays the same no matter which company you apply with. Medicare Supplemental rates vary with zip codes. For example, the cost for Medicare Supplement plans in Dallas, TX could cost more (or less) than plans in Austin, TX. However, the coverage options remain the same. This is why it’s important to get a Medigap quote comparison. Get a Texas Medicare supplement quote comparison online free or call Retirement Transitions to speak with a Medicare Insurance Specialist.